July 15, 2013 - In a letter to leaders of congressional tax writing committees, American Association of Airport Executives (AAAE) President Todd Hauptli today called on lawmakers to close the current tax loophole that allows U.S. air carriers to avoid paying federal excise taxes on the billions of dollars in annual revenues collected on baggage fees and other ancillary charges and to permanently eliminate the Alternative Minimum Tax (AMT) penalty on airport-issued private activity bonds. "In addition to frustrating passengers, the imposition of baggage fees and other ancillary charges as 'add-ons' to the final price paid for a ticket creates confusion for consumers and effectively robs the Airport and Airway Trust Fund of hundreds of millions of dollars in annual revenue, funds that would otherwise be available for critical airport and aviation system upgrades," Hauptli wrote. "The diversion of funding from the aviation trust fund through the ancillary fee loophole adds to the already daunting challenges facing the nation's airports as they struggle to fund more than $10 billion in annual needs." Hauptli noted that taxing baggage fees at the 7.5 percent rate paid on airline tickets would have generated more than $260 million in 2012, and taxing all ancillary fees would have produced hundreds of millions of dollars more. With air carriers are aggressively shifting the airline pricing model away from utilizing ticket prices to generate revenue to a greater reliance on ancillary fees, the amount of revenues lost because of the existing tax loophole will likely grow in the future. 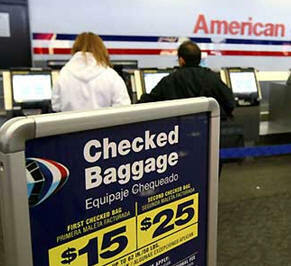 According to data released by the Department of Transportation in late June, U.S. passenger airlines collected a total of $800 million in baggage fees in the first quarter of 2013. Airlines collected almost $3.5 billion from baggage fees in 2012 more than the amount Congress approved for federal grants to all airports through the Airport Improvement Program in FY 2013. Additionally, information about these substantial fees is not fully disclosed through all ticket distribution channels used by consumers, which makes it difficult for travelers to compare the total costs of flights from different carriers. Concern about this practice has been highlighted by the Government Accountability Office and is now the subject of a DOT rulemaking expected to be completed later this month. The fact that the carriers will not fully disclose voluntarily all of the fees they impose to travelers searching for fares is troubling. Finally, to help airports invest additional funds in necessary infrastructure development and support high-paying jobs for workers across the country, AAAE also advocated for the permanent elimination of the AMT penalty on airport-issued private activity bonds. To view the full AAAE letter, click here.